Last month, we told you Costco Canada started selling iPhones online for the first time, with Apple’s aging iPhone SE available starting at $299.99. 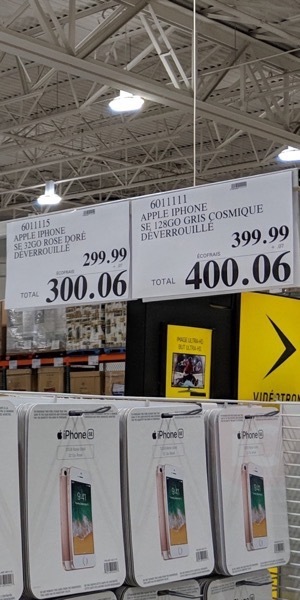 iPhone in Canada reader, Kevin, spotted these iPhone SE units on sale at the Vaudreuil-Dorion Costco location in Quebec. Costco’s pricing of $299.99 for a new 32GB iPhone SE is cheaper than what Koodo is offering for a pre-owned unit at $439. It’s also cheaper than the $249 USD pricing from Apple.com (about $331 CAD), which recently had the device on clearance. The iPhone SE–which first debuted in March 2016–is powered by Apple’s A9 chip and comes with a 4-inch Retina display, along with Touch ID. At the starting price of $300, it will run iOS 12 and could make an ‘affordable’ starter iPhone for the kiddies. Let us know if you’re seeing the iPhone SE selling at your local Costco. The phone comes with a 90-day return policy from Costco (poutine not included).